Galette’s are one of my favorite desserts to make. It’s quick, easy, and oh-so-delicious. It can be savory, sweet, seasonal, non-seasonal, breakfast, lunch, or dinner. What’s not to like? It’s also one of my go to items for parties, potlucks and gifts. I made this particular galette as part of Mother’s Day gift for my mom this year. I know, like me, she doesn’t like overly sweet desserts. 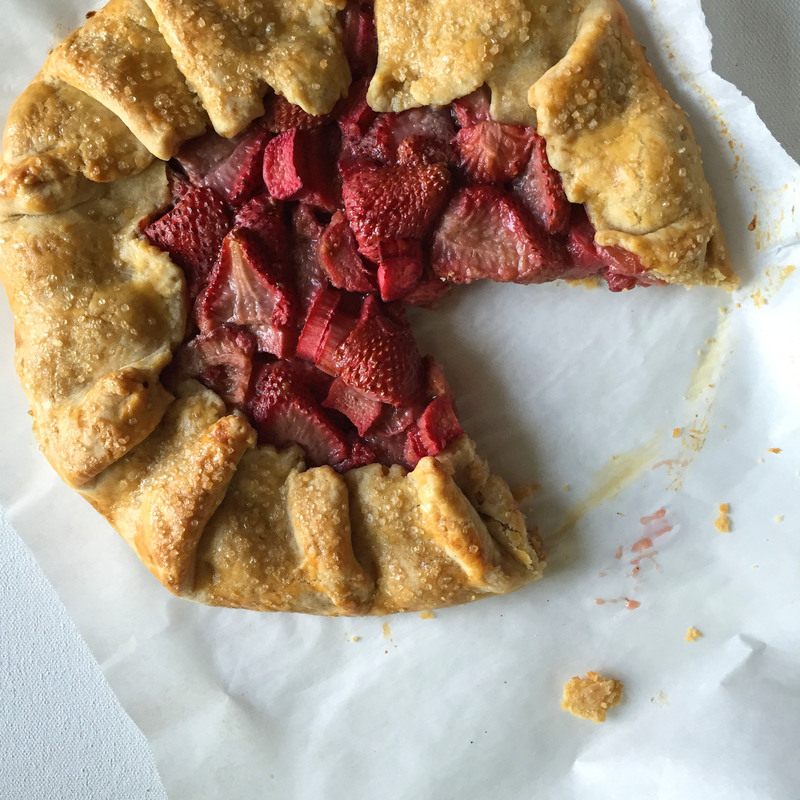 This strawberry rhubarb galette is perfect balance of sweet and a little tart. Perfect for snack, light dessert, or even breakfast (for me, anyway). You can make this recipe even easier and faster by using store-bought pie dough. But with a little bit more time and effort, you can have far superior quality crust if you make your own. About 6 months ago, I switched to using coconut palm sugar in place of refined white sugar. I’m so happy I did because I no longer get that sugar rush that goes straight to my head which made me feel terrible. And I’m more happier with my baked goods results because everything comes out a tad less sweeter in comparison to when I used to bake with refined white sugar. It does take a little adjusting to. Because the “kernels” are bigger, it takes longer to dissolve. So when creaming butter and sugar, it takes a bit longer. Even then, you’ll still be able to see specks of the sugar. I don’t mind this since I have yet to find my finished goods compromised in any way. If a recipe calls for the sugar to be dissolved, make sure to give yourself a bit more time. In baking, keep in mind that because it’s less sweeter, you may need to add a bit more than a traditional recipe that calls for refined sugar. I always stick with what the recipe calls for since I prefer the less sweet. To make the dough, pulse flour, sugar, and salt in a food processor. Add the COLD butter and pulse until sand-like consistency. While pulsing, slowly drizzle in the cold water until it comes together. Don’t over mix. Transfer to a lightly floured surface. Form into a 5 inch disc. Wrap in plastic wrap and let in rest in the fridge an hour or overnight. To make the filling, in a medium bowl, combine the strawberries, rhubarb, lemon zest and juice, 2 tablespoon of flour and 2 tablespoon of sugar. Let it macerate while rolling out the dough. Combine the leftover flour and sugar in a small bowl. Roll out the dough to roughly 12-14″. Evenly, sprinkle the flour and sugar mixture over the dough. 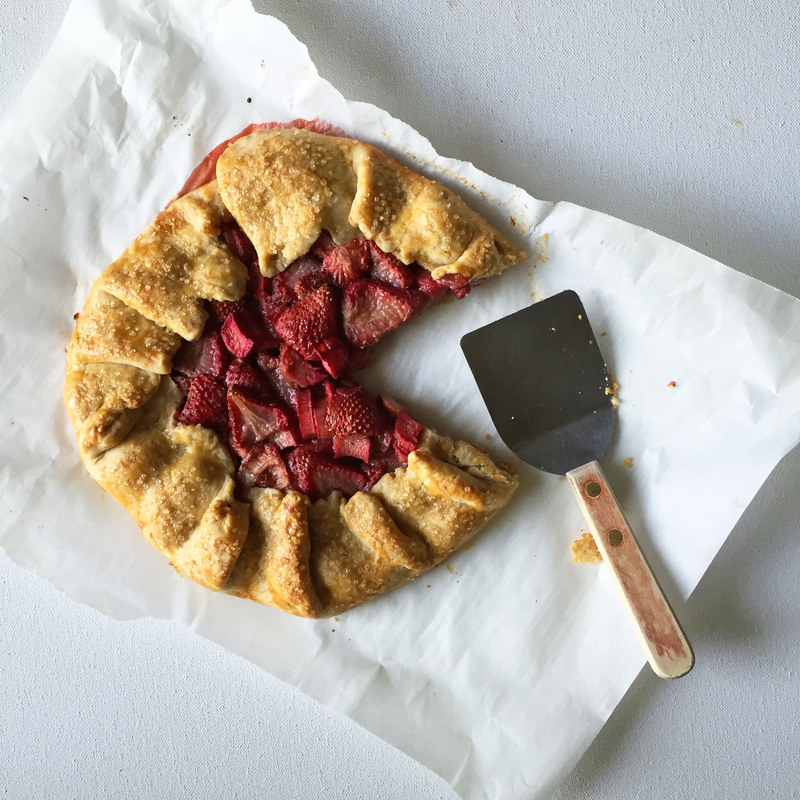 (This “catches” all the juices released by the berries so the crust doesn’t get too soggy.) Spoon in the filling leaving about 3-4″ edge. Gently fold in the edges toward the middle forming a “crust”. Brush on the egg wash on the crust and sprinkle with turbinado sugar, if using. Bake for 40-45 minutes until the crust is golden brown. Let it rest 10 minutes. Serve with whipped cream, vanilla ice cream, or as it. It’s all tasty!